Circus is specially designed to withstand the rigors of everyday use in industrial and manufacturing environments as well as cosmetology, health spas, beauty salons and clean room applications where FOD is a concern. No knobs to tighten, nothing to adjust. A 5-diopter white crown optical-quality glass lens provides distortion-free viewing. 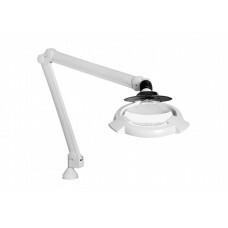 The highly- flexible, self-balancing shade and 45" internal spring arm allows the lamp head to be positioned horizontally, vertically or laterally.